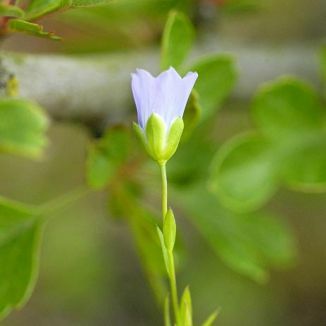 Pale Flax is not easily confused with other wild plants on this web site. Biennial or perennial, this delicate little wildflower has pretty, pale-blue flowers (12-20mm) borne in loose cymes. These have five, veined petals which drop early, the globular fruit becoming rounded with a short little beak on top (see bottom picture). The flowers bloom in June and July. The leaves are alternate, narrow, untoothed and pointed with three veins. This plant, which is pollinated by bees and wasps, grows in dry grassland and on neutral or calcareous soil. It is a native plant belonging to the family Linaceae. I found this tiny little plant growing on the top of an old bridge at Scarawalsh, Co Wexford in 2008 and I photographed it at that time. The identification was kindly confirmed to me by Dr Darach Lupton, Dip.Hort., BA Hons. (Mod), PhD of the National Botanic Gardens of Ireland. 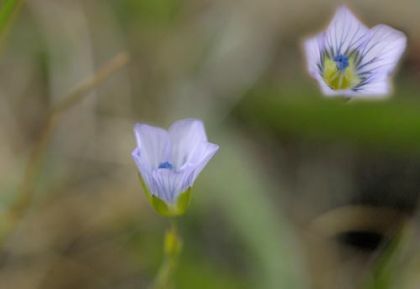 This is a close relative of Linum usitatissimum which has been grown for centuries to make linseed oil and linen, the production of which is believed to have started over 5000 years ago. The oil is produced from the seeds whereas the fabric is made from the stems of the plant.